We endeavor to be a socially conscious, supportive, diverse and inclusive community who value individuals and their self-expression while nurturing our connections with each other, our surrounding communities, our urban home of Chicago, the world and the planet. We especially encourage the creation of connections, collaborations, art and performance among dancers, drummers, artists and musicians who feel drawn to the tribal vibe. By no means do we intend "tribal" to mean a single religion, spiritual path, ancestral branch or regional identity. Rather, our tribe are those of any gender, race, creed, ethnicity, orientation, who recognize each other as honoring spirit, consciousness, love, embodied rhythm and the healing power of sound and music. 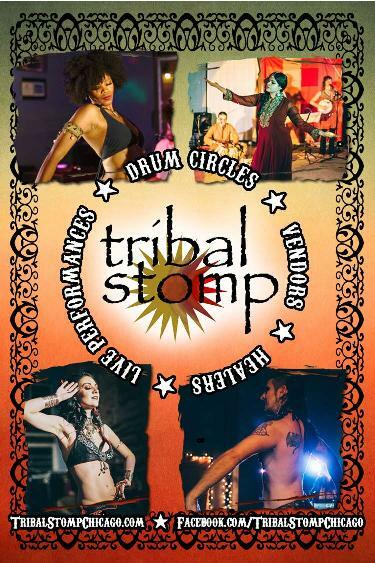 What we do: Our main productions are the Tribal Stomp events four times a year, in winter, spring, summer, and autumn. These events feature live musical acts, always accompanied by traditional or tribal fusion dancers, preceded by a community drum circle (outdoors around the fire when weather permits). On the main floor accompanying the performances we often feature a live visual artist who creates in our space. We have a tarot card reader and three healing rooms for our attendees to visit, with services ranging from shiatsu massage to sound healing. We have a hallway full of vendors offering tribal jewelry, clothing and accessories, as well as natural, healthy food, kombucha, coffee, tea and water. For our Summer Tribal Stomp Festival, we have a day full of activities, performances and workshops in addition to our evening program. We also produce drum jams for spring equinox, summer solstice, fall equinox and winter solstice. These jams are self-contained, are community driven, and often function as fundraisers. In the past we have raised money for Standing Rock Reservation and Refugee One in Chicago through our drum jams. We look forward to raising awareness and funds for other worthy causes in the future. We have been (and hope to be again) a presence in the Cultural Mile Halloween Parade, as well as holding a kids community drum circle for the Cultural Mile Halloween Festival and hope to represent at other events throughout the year. We are also planning some special holiday events we hope to announce soon. We also have a burgeoning outreach program that creates drum circles for programs that aid at-risk youth, such as the Penedo Organization in Chicago. This is an area of Tribal Stomp Chicago we hope to grow in the future. A Drum outreach workshop for the penedo organization hosted by the education and counseling center at depaul university.